Fawzi Abu Jame'a had finally finished building his family's dream home just eight months before the beginning of the war between Israel and Hamas, the Islamic party that governs Gaza. Unable to work because of diabetes, Jame'a had borrowed money from friends to buy the last materials he needed, but he believed it was worth it. His two children could play inside without being seen by Israeli soldiers watching from the border less than a mile away. Then came the war, and Jame'a's house soon fell to a barrage of bombs, mortars, and weaponized bulldozers that pushed through the rubble ahead of advancing Israeli ground troops. He fled with his wife and children in the middle of the night, with no time to grab even their documents, escaping to a U.N. school some two miles away. That became their home for the next month before he arranged to move into a friend's crowded apartment. But now he's back home. His house remains a pile of rubble, on which he still owes almost $2,000. But in a vacant space beside it, he has moved into a house built by Catholic Relief Services, the international relief and development arm of the U.S. Catholic bishops. CRS is building hundreds of what it calls "transitional houses" throughout Gaza, where more than 10,000 houses were completely destroyed in last year's conflict. They are designed to last at least five years, after which residents hope they will be able to move into a more permanent dwelling. Yet in a land where residents have experienced three wars in the past six years, people such as Jame'a will most likely have to stretch the word "temporary" as long as they can. "It's an excellent house, and with a window it's not too hot. I feel fortunate, as a lot of people here still have nothing," said Jame'a, who has already added a patio, kitchen cupboards, and several other improvements. "And then I'm going to see how I can rebuild my house. I've got the land and my brothers live nearby and will help me. If necessary, we can live in this house for 20 years until we build a new home. But we will build it," he told Catholic News Service. The CRS housing program is funded from the organization's own budget, along with contributions from other sources, including Catholics in France and the United Kingdom, and Mormons and Muslims in the United States. "Palestinians in Gaza consider their house as their paradise. They spend most of their lives building a new house to provide adequate and dignified space for their children. There are no green spaces to let their children play outside, so the house becomes a place for the children to play, learn, cook, eat, watch television, all the normal things of life. So when they lose their homes, they are heartbroken and depressed. Their home is their life, their dream," he said. Matt McGarry, the CRS country representative in Jerusalem, said the West Bank and Gaza, the narrow territory along the Mediterranean, is a frustrating region in which to work. 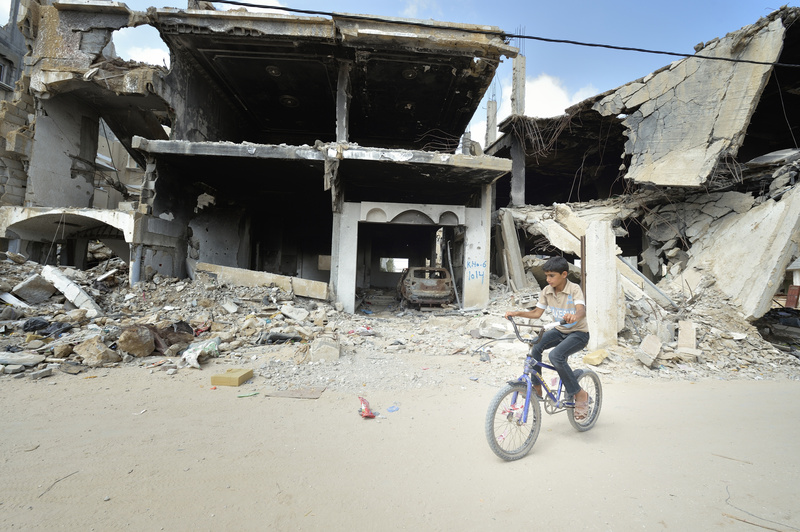 "During the war, Gaza was very bad. During normal times, it's just bad. The blockade and siege never go away," he said. "Most of what we do is try to staunch the bleeding, push the rock up the hill, try to improve the quality of people's lives in the short term. Ultimately, until there's a political solution to the conflict, everything we do is largely temporary. "The unemployment rate here is 44 percent, the highest in the world. It's difficult to get in and out, there's a dysfunctional political system and economy, and so most of what we try to do is keep things from getting worse for ordinary people," he said. Sami El-Yousef, regional director for Palestine and Israel for the Catholic Near East Welfare Association, said the gritty resolve of Christians in Gaza to keep rebuilding after repeated outbreaks of violence is inspiring. His organization supports a network of church-sponsored hospitals, clinics, schools and vocational training centers in Gaza. "The Rosary Sisters' school was damaged in the 2008-2009 war, and we fixed it. It was damaged again in the 2012 war, and we fixed it. And then last year, it was damaged again in the war. So we fixed it. We have to keep coming back again and again, but we do it because these people here are the living stones. They provide critical services to the community. It's not easy to work in Gaza, and operating a Christian institution under Hamas is never easy, but people here continue to be heroes because of the love with which they care for others," he said. Tensions between Gaza's small Christian community and Hamas worsened in the months before the war, after the Islamic rulers ordered all schools in the territory to completely segregate boys and girls. Churches operate five schools in Gaza, with some 3,000 students -- 93 percent of whom are Muslim -- and they refused to obey the Hamas edict. Then came the war. No one talks about segregation in the church schools any longer. "There has been a shift in thinking within Hamas toward the Christian community and institutions as a result of our interventions during the war," El-Yousef said. "Who were the first responders during the war, the first institutions to open their doors as shelter, to deliver food packages and hygiene packages out there in a predominantly Muslim community? I think Hamas woke up all of a sudden, especially after a tense period of two years in which they'd been trying to enforce the segregation law in the schools, and they realized that the Christian institutions are a plus for them and for society. So there's a new respect for the church. Last December, when the Orthodox Church held its Christmas bazaar, the highest leaders of Hamas came to greet them. That didn't happen before." Some Islamist groups in Gaza represent more extremist views than Hamas: Islamic Jihad, the Salafists, and a relatively new group claiming allegiance to the Islamic State. Yet Hamas has cracked down on such groups, especially the Islamic State wannabes, leading to gunbattles between the police and the hardline Islamists. So some say that, despite a troubled history, Hamas, in effect, protects the Christians of Gaza, just as it protects Israel from much more menacing groups. Christians in Gaza recognize that and remain committed to living in Gaza, as complicated as it is. "We're not going to resolve the Palestine-Israel conflict. But we can remain at the side of the Palestinian people, struggling with them to meet their physical, economic, emotional and spiritual needs," said Father Jorge Hernandez, an Argentine member of the Institute of the Incarnate Word and pastor of Holy Family Catholic Parish in Gaza City. "None of us left during the war. It's our presence that counts."